Every now and then a company needs to revisit it's branding and perhaps update it slightly to keep it fresh and contemporary. The Pure Energy has done exactly that and updated it's branding to refelect the business activities. Back in the late 80's Pure Energy started as a company designing sounds for the music industry specialising in sound banks for the Roland, Yamaha, Akai and Korg Synthesizers. We also produced interfaces for old music equipment like the Clock II Sync for the Roland TB-303 which was instrumental (literally!) in creating the sound of Acid House music. The logo was created to reflect the spacey far out sounds that we were creating and what better than an alien wearing headphones! Later on, in the mid 90's the music scene that we were into started to fade and we turned our attention to the web. Previously we had developed our own website to sell the sounds and products we created world-wide and saw first had the huge potential of the Internet from a commercial persepctive. The year 2000 came along and again it was time to look at the branding. A new millennium and a new look. 3D was very much in vogue and we transformed the logo into a 3D model that could be animated and used in the opening sequence of video productions that we were becoming involved with. 2004 saw a complete return to simplicity. Gone were the complicated backgrounds and 3D text. Instead a simple clean corporate grey look that fitted very well with the type of projects that we were undertaking. They say that fashion and style repeats itself - well this could be true for branding and logos too. Pure Energy has now revisited its orginal branding to incorporate it into a new striking image. For years we have displayed the pure energy alien as a poster on the wall at our offices. It acts to remind us of the past and is often commented upon by visitors as a great image. 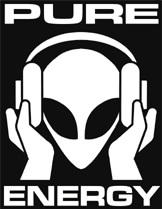 So now, the alien image with headphones is back again. The alien representing the future and our constant reach for projects that are ahead of thier time and the headphones representing the media side of our company which is growing very significantly. It was again, the perfect icon. However, simply revining the old logo was not going to cut the mustard. The colouring had to be changed and the alien needed to be removed from the inflexible solid background. The alien image is so striking and memorable that with time we believe that the isolated use of the alien logo itself will become enough to represent the company and its work.